How can I change my name, password or email address? 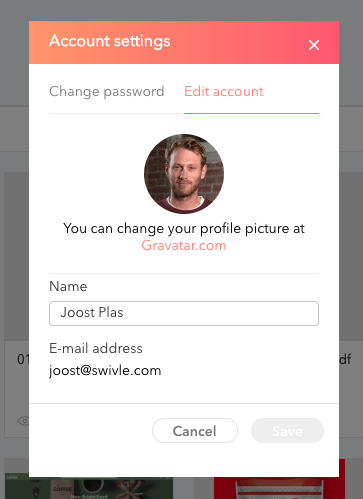 Learn more about the changing of your name, password or email address in Swivle. Unfortunately you cannot change the email address of your Swivle account at this moment. Your name and password are configurable in the Account settings (see screenshots below). To change your password you can also use the 'Forgot password' option. If you need to change the email address of your account, we recommend creating a new user. If you have multiple Swivle licenses, you can ask one of the Swivle admins to delete your current account, and invite you on the right email address. If you only have 1 Content Manager license, please reach out to us at team@swivle.com, so we can help you out! 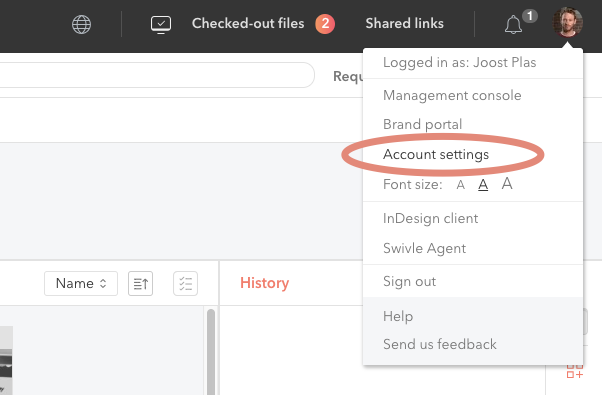 Figure A: accessing the Account settings panel from the Avatar menu.